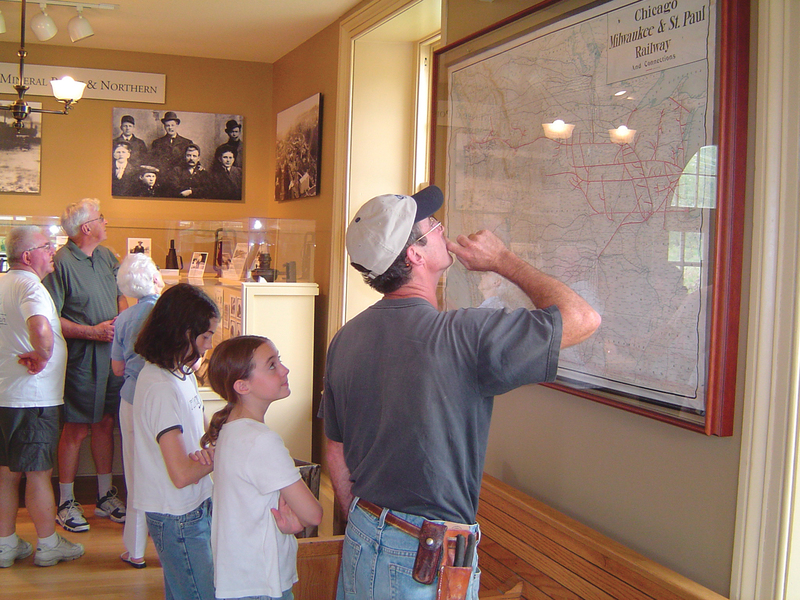 Visitors explore the Mineral Point Railroad Museum, the oldest standing depot in the state. A tour group visits historic downtown Mineral Point. Mineral Point, Wisconsin, (population 2,617) is Wisconsin’s third oldest city, with permanent settlements of Cornish immigrants dating back to 1827. The origins of the town can be traced to the discovery of lead, or “mineral,” in the late 1820s in the hills of southwestern Wisconsin. Prospectors, miners, and adventurers swarmed the hills and lived in crude shelters known as “badger holes,” from which Wisconsin got its nickname: the Badger State. The lead boom was facilitated by a steady stream of skilled hard-rock miners who emigrated from Ireland, Germany, and Cornwall in England. With a committed labor force and rich lead deposits, Mineral Point became the most important lead-producing region in the nation during the mid-19th century. By 1830 Mineral Point’s population was greater than that of Milwaukee and Chicago combined. With the coming of the railroad in 1857, Mineral Point became an important center of commerce. The community experienced a second mining boom in the 1870s with the discovery of zinc carbonate, with zinc production eventually surpassing that of lead. The railroad was the economic tool that carried the zinc to the area’s processing facilities and acted as a conduit to other Midwestern economic centers. In 2004, the Mineral Point Railroad Depot was restored and reopened as a public museum, averaging 3,000 visitors each year. The oldest standing depot in the state, it houses an extensive collection of railroad memorabilia, including the original 15 foot passenger bench, baggage cart, ticket booth, safe, and agent desks. Plans include the creation of a museum-quality diorama of the railroad facilities around the depot circa 1917. Other local attractions include the Orchard Lawn House Museum (1868), a historic downtown, and a number of historical architectural walking tours. Visitors can take a step back in time with visits to the Pendarvis State Historic Site where costumed guides lead them through a restored miners settlement and tell the story of early immigration and mining in Mineral Point. The annual Cornish Festival in September celebrates Cornish heritage and history and includes such events as a genealogy seminar, Cornish language lessons, and Celtic and Cornish food and entertainment. Mineral Point was recognized in 2007 as one of the National Trust for Historic Preservation’s Dozen Distinctive Destinations. Today Mineral Point is home to more than 50 artisans, authors, musicians, and performing artists who thrive on the town’s rich culture to create a unique artistic community. Many historic buildings are being adaptively reused as galleries, art studios, shops, businesses, and homes.